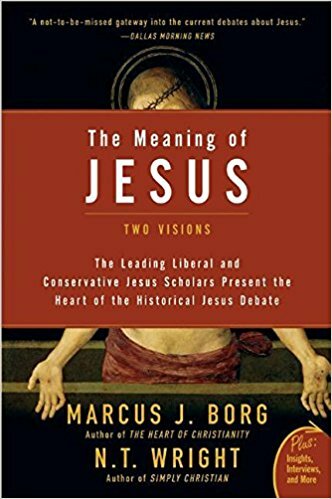 I’ve found the book The Meaning of Jesus to be one of the most helpful, illuminating and thought-provoking that I’ve ever read on the Bible, Jesus and Christian Theology. This is in large part due to the way in which it’s written: a dialogue between two theologians who diverge in their perspectives yet continue to have (have had) an open relationship dating back to their long ago days working as graduate students together. It models a different approach to theology and faith than we usually see nowadays in our zero-sum culture. Plus these two great academics can both write in a very easy to follow every day vernacular about complicated ideas. Buy & read the whole book if you enjoy it! The selection I’m purposing for Advent is their dialoguing chapters on the Birth Stories of Jesus in the gospels, in particular relating to the Virgin Birth. It’s worthwhile to think through on your own, as it’s oftentimes one of the first questions asked about the story. What does the virgin birth mean to you? A friend who has become a well known artist, Scott Erickson, wrote about his own wonderings about the Virgin Birth in a FB post this Advent. I’m including it in this post too, as I found it quite thought-provoking. Virgin birth. Honestly… I’m sure how to write about it. From the tradition I come from, it’s included in the creeds of belief… which in it’s best manifestation is a unifying conversation, and in it’s worst, a rubric for rejecting doubters. Also, I do know that throughout historical legends, it was not uncommon to have a virgin birth as part of that mythological tale. So this Christian tale is not unique in it’s origin hypothesis of the gods conceiving children. Transformation is a Virgin Birth. It is nothing that you are in charge of… or is laid upon you to muster up the strength to accomplish. It begins quietly and deeply with you. A Divine inception in the deepest place where your truest life is birthed. This is the place where the Divine begins new life. And newness of life is what we all desire. This is the work He is wanting to do in the soul womb of all humanity. Almighty, I do not know what needs to be birthed in me. I do not even know if I believe that you want to. But I open up the deepest place in me and ask that you would birth transformation in me. Whatever that is. May it be done to me according to your word.